..:: PreQuimm - Colchicum Autumnale ::..
Synonyms. Latin: Colchicum commune Meck. Spanish: colquico,colquico de otono, azafran de los prados. 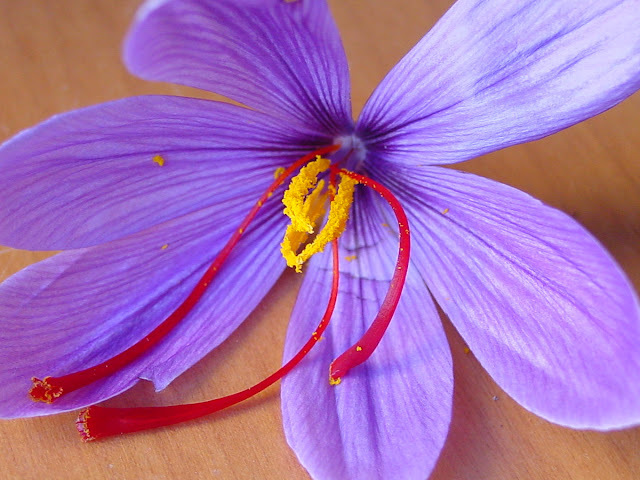 English: Meadow saffron, Autumn crocus, Wild saffron, Naked lady. French: Colchique. German: Herbstzeitlose. Description. A perennial herb, with a short subterranean stem, having three to five dark green shining leaves 15 to 30 cm long and 2.5 to 5 cm broad, appearing in April. A solitary, large, reddish-lilac colored flower, with a tube 15 to 18 cm long, appearing for a few days only, the preceding September or October. The bulb, or corm, is somewhat the shape of a chestnut; has a tuft of filiform roots beneath, an external brown and internal reddish-yellow coat. When gathered, about a year old, it is from 4 to 5 cm in length, 2.5 cm wide at the lower end, flattened on the side on which a new corm is forming, and rounded on the other. The interior is white, firm, fleshy and homogeneous, unlike the tulip, which is scaly. It yields a milky juice of an acrid, bitter taste and disagreeable smell. Habitat. It is found in moist meadows, in middle and southern Europe to the Mediterranean, Greece, Turkey and the Crimea, and in many parts of England. In the Swiss Alps it is found at an altitude of 1,500 m.
Used parts. Fresh harvested spring bulbs.